Want to learn how to Cross Country Ski? Need a few more tips to make that jump from beginner to intermediate? Looking to give Skate Skiing a try? Interested in meeting other XC skiers and joining a larger ski community? 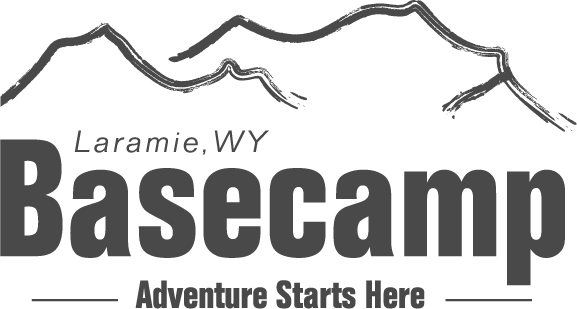 Laramie's Basecamp has just the thing! Join us Saturday, February 9th for a FREE Learn To Ski Day. That's right, lessons and rentals are FREE!! All you need to do is make a reservation before Saturday morning so we can make sure we have the proper fitting boots, skis, and poles you'll need. Call us at the shop at 307-703-0172 to make your reservation today. We will need your shoe size, height, and weight to reserve the appropriate gear. The morning of February 9th stop by the shop 1 hour before your class time to pick up your gear, try on boots, and give yourself ample time to drive up to Tie City Trailhead (see map below) at the Tie City/Happy Jack trail area. Class instructors will meet you there! Wearing the appropriate clothing and layers can make all the difference while XC skiing. Let's discuss some tips to keep in mind while skiing here in Laramie. Pack a small backpack to hold extra layers & bring water!! LAYERING: wearing multiple lightweight, yet warm, layers is the key to success with an aerobic activity such as XC skiing. Begin with a tighter fitting base-layer and add a fleece jacket or fleece-lined active top as a mid-layer. Finally, add a wind and water resistant shell as an outer layer. Make sure it is breathable too. You can always remove layers if you warm up, so opt for more rather than less. The Tie City trailhead parking lot can be windy and cold but once you move into the trees, it is much more pleasant. PANTS/LEGGINGS: on the bottom you want pants or leggings that allow for mobility. Layering a few pairs of leggings works well underneath a pair of wind resistant pants. We offer many SWIX pant options in store. Additionally, wearing gaiters helps keep snow out of your boots. SUNGLASSES: if the sun is out you will want a good pair of sunglasses to protect your eyes! That white snow can be blinding on a sunny day!! GLOVES/MITTENS: choosing between the two is a personal preference and again, the layering system works well here. A thin wool liner glove fits nicely under a heavier insulating glove/mitten. HATS/BUFFS: keeping that noggin warm is important and you have a few options. Headbands, wool hats, or fleece-lined caps work great while XC skiing. Something to keep your neck warm and out of the wind also helps. It is always smart to pack these layers in case, you can always remove them if you get hot. SOCKS: wool or synthetic socks are a great option, no cotton! XC ski boots are designed to keep your feet warm, but no one likes cold feet. A double layer of socks can help if boots feel a little large, but if the boots fit one pair is fine. Always pack extra socks to change into afterwards so the car ride home is enjoyable! WE LOOK FORWARD TO GEARING YOU UP TO SKI!!!!!!!! !